It was a Saturday like that of any other January weekend in Ontario. It was brisk outside and there was a decent amount of the loved/hated snow covering everything on this nice calm day. A nice quiet day everywhere; except at Shooter’s Choice in Waterloo, Ontario. On January 26th was the Ladies Day Open House, hosted by the Colby Shooting Club, which was an event conceived and designed to give women of all walks of life and age groups a chance to experience shooting a wide range of firearms. What an event it was indeed with over three dozen participants, the majority of whom had little or no prior firearms experience. With their employment ranging from waitressing to being in the reserves, and diversity in age groups, the only common thread that linked them all was a curiosity and interest in firearms. Surprisingly, of the few attendees who had firearms experience, most had only experience with rifles, and so being able to handle and shoot the great variety of handguns present was a huge plus. Handguns ranged from the plentiful models of pistols akin to the Ruger Mk II’s and Glocks, to the less common ones such as an AutoMag II, and an S&W TRR8 Revolver. Some of the more exotic firearms that were the two 9mm AR-15’s which were very popular with the participants. Large smiles marked the faces of everyone who participated. Like many others; Sabrina, Neola, & Alanna found the entire experience to be great fun, exciting and informative. As usual there were only two rules that needed to be followed by the participants for such an event to be considered to be performed successfully. Rule #1 – Safety cannot be compromised. Rule #2 – Have fun. I can proudly say that both rules were followed to superior levels throughout the event. The ladies were encouraged to ask questions and visit all the instructors and sample the wide variety of firearms available. 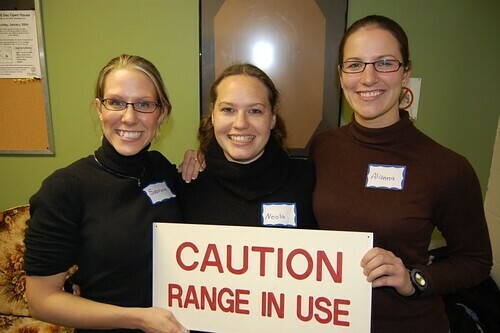 While wearing expressions ranging from focused concentration to face splitting smiles, the ladies were able to gauge their accuracy and performance on both static targets and a multitude of reactive targets such as balloons, hanging bowling pins, and reactive decals. From the thousands of rounds discharged, there was not a single target that was not filled full of multiple holes, except of course the balloons which proved to be far less resilient. Ammunition ranged across the spectrum, including .22 Long Rifle, 9mm, .38 Special, and as well as several other calibres that were delivered to the various targets down range. It was obvious to even the casual observer that everyone who participated was enjoying themselves. 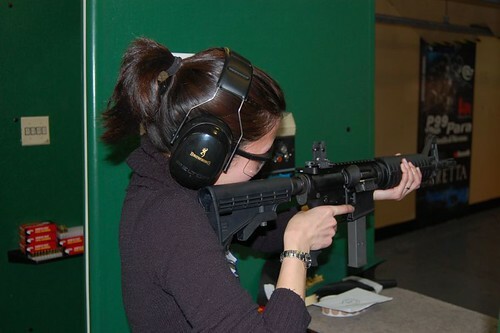 Attendees were able to experience a wide range of firearms. Enjoying herself immensely, Olivia shoots one of the more exotic firearms present. It must be pointed out that such an event would not have been as successful if not for the time and efforts of volunteer members of the Colby Shooting Club and the backing by Shooter’s Choice in supplying the expendables. A special thanks to Steve Aubie, M. J. Purtle and Jeff Gardiner for their efforts at promoting and organizing the event and to all the ladies who made the entire event worthwhile. While I doubt the volunteer instructors were having quite as much fun as the women who were doing the shooting, I hopefully speak for the other instructors when I say that it was a great pleasure in introducing so many people to the shooting sports.